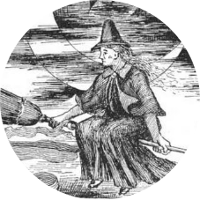 Mary (Perkins) Bradbury was accused and convicted of being a witch during the Salem Witch trials. Execution was delayed and she eventually was discharged. 2 Massachusetts Vital Records to 1850 (Online Datebase), New England Historic Genealogical Society (2001-2008), Salisbury Deaths, p. 530. 3 New England Historical and Genealogical Register, (New England Historic and Genealogical Society), July 1942, Vol. 96, p. 238. 4 Anderson, Robert Charles, The Great Migration Begins: Immigrants to New England 1620-1633, Vol. 3, P-W , Boston: New England Historic Genealogical Society (1995), 1432, [Christening]. 5 Anderson, Robert Charles and others, The Great Migration: Immigrants to New England 1634-1635, Vol. I, A-B , Boston: New England Historic Genealogical Society (1999), 379, [Christening]. 6 Anderson, Robert Charles and others, The Great Migration: Immigrants to New England 1634-1635, Vol. I, A-B , Boston: New England Historic Genealogical Society (1999), 379, [Death]. 7 Burrows, Louisa Libby, Genealogy of William French Burrows, Pasadena, CA: Privately Printed (1938), 21, 23. 8 Kilpatrick, Marian Douglas Jones, The Kilpatrick Family: Ancestors and Descendants of Marian Douglas Jones and Robert Jackson Kilpatrick, Beatrice, NB: Privately Printed (1930), 151. 10 Roberts, Gary Boyd, "#77 Royal Descents, Notable Kin, and Printed Sources: An Assortment of Famous Actors", (accessed 10/02/2014), New England Historic Genealogical Society (Online Database). 11 Roberts, Gary Boyd, Notable Kin, Volume 1 , Santa Clarita, California: Carl Boyer, 3rd (1998), 173. 12 Roberts, Gary Boyd, Notable Kin, Volume 2 , Santa Clarita, California: Carl Boyer, 3rd (1999), 187-188. 13 Weller, Sam, The Bradbury Chronicles: The Life of Ray Bradbury, Predicting the Past, Remembering the Future, New York: HarperCollins (2005), 16.